Habit: Shrub, [tree] glabrous to hairy, rhizomed or not, burls generally 0. Stem: trailing to erect. Leaf: cauline, alternate. Inflorescence: raceme or flowers 1, bracted; bud scales present; bractlets generally 2. Flower: sepals 4--5, 2/3 to fully fused; corolla cylindric to urn- or cup-shaped, petals generally 4--5, +- 2/3 fused, generally white; stamens 8 or 10, filaments generally glabrous, anthers elongate, awned or not, dehiscing by pores on small tubes; ovary inferior, chambers 4--5, or appearing 10 by intrusion of ovary wall, placentas axile, stigma head-like. Fruit: berry. Seed: generally many. Unabridged Note: Vaccinium oxycoccos L. reported from California in FNANM; records lacking. 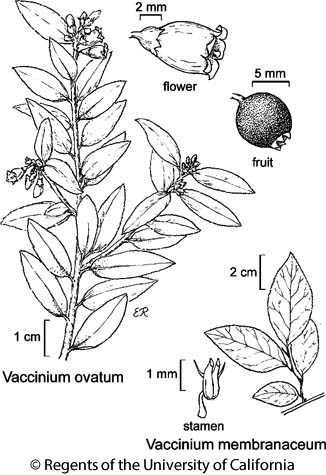 Unabridged Reference: Vander Kloet 1988 The genus Vaccinium in N.Am. Habit: Shrub, hairy, rhizome 0. Stem: erect, 5--30 dm, stout, generally not rooting; twigs not angled, +- gray. Leaf: evergreen, 2--5 cm, elliptic to lanceolate, leathery, serrate, abaxially with sparse, dark glandular hairs, veins not prominent. Inflorescence: umbel-like, axillary, dense; pedicel jointed to flower, bractlets 2. Flower: sepals 5, fused at base, lobes deltate; corolla < 8 mm, urn-shaped, lobes < tube, erect to spreading when anthers open; filaments +- hairy, anthers often short-awned. Fruit: 6--9 mm, black, glaucous or not. Chromosomes: 2n=24. Synonyms: Vaccinium ovatum var. saporosum Jeps. Citation for this treatment: Gary D. Wallace 2017, Vaccinium ovatum, in Jepson Flora Project (eds.) Jepson eFlora, Revision 5, http://ucjeps.berkeley.edu/eflora/eflora_display.php?tid=47685, accessed on April 19, 2019. NCo, KR, NCoRO, CCo, SnFrB, n ChI (Santa Cruz, Santa Rosa islands), WTR, PR (uncommon); Markers link to CCH specimen records. Yellow markers indicate records that may provide evidence for eFlora range revision or may have georeferencing or identification issues. Purple markers indicate specimens collected from a garden, greenhouse, or other non-wild location.